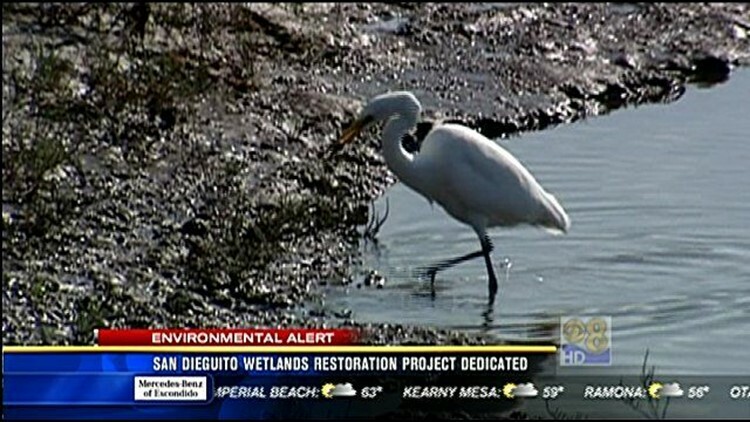 SAN DIEGO (CNS) - The San Dieguito Wetlands Restoration Project, which revitalized 150 acres of coastal wetlands near the Del Mar Fairgrounds, was dedicated Monday by project leaders and sponsors San Diego Gas & Electric, Southern California Edison and the cities of Anaheim and Riverside. The $90 million effort was designed to mitigate adverse environmental impacts on marine life by the ocean water cooling system of the San Onofre Nuclear Generating Station. The system does not affect 94 percent of fish in the area, but some small fish and larvae are impacted, according to SCE. The restoration included creation of the coastal segment of the Coast to Crest Trail along the San Dieguito River and a perimeter that will help protect sensitive habitat and vegetation. The habitat already is a fish nursery and refuge for migratory waterfowl and endangered species, and provides open space for community recreation. "The newly restored wetlands area has already seen a tripling of bird species and colonization of the nature preserve by millions of baby fish, creating a thriving environmental asset for the San Diego region," said Pam Fair, SDG&E vice president and chief environmental officer. The area that was restored runs from the ocean on the west side to El Camino Real on the east side.